Tuxedo Bass Drum Bag, Drum/Percussion Case, Gig Bag, or Cover from Humes & Berg. 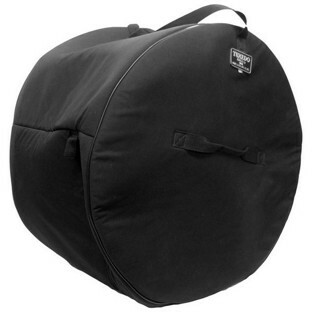 The Humes & Berg Tuxedo Bass Drum Bag is one type of many different drum cases offered up by Humes & Berg. These Tuexedo drum bags have become pretty much the industry standard when it comes to cases to protect your drums. It is indeed a soft case, but there’s plenty of padding there to protect the drum for sure. The bass drum bags come in all different sizes to accommodate kick drums of all sizes, and this is going to be the case with all of their drum bags for tom toms and snare drums alike. I’m not a drummer by trade so I don’t have any of these bags at home, but I’ve worked with countless drummers who have the Tuxedo Bass Drum bag at least if not cases like this for all of their drums. A lot of these drummers are professional studio musicians so you that they’re traveling a lot their drums and are going to want to protect them as well as possibly being that they’re expensive drums. The drummer of my old band had this for kick drum and still has it do this day as I know it’s saved him from numerous bumps and bruises on his drums throughout the years. 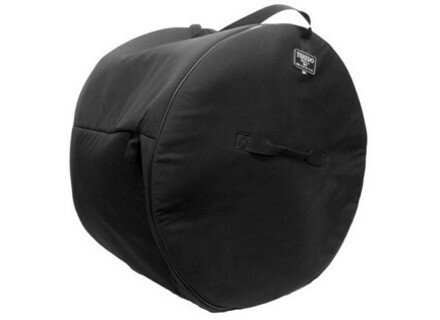 The Humes & Berg Tuxedo Bass Drum Bag isn’t too expensive but also isn’t as cheap as one might think. However, there’s no super cheap way to get good drum cases to protect your drums and in the end it’s probably going to be worth it to save them from damage if you’re moving them from place to place on a consistent basis. Serious drummers who are touring or doing many recording sessions definitely need to consider the Humes & Berg Tuxedo Bass Drum Bag and their cases for other types of drums as well.